It was the most catastrophic and frustrating ticket on sale event that I can recall -- probably in history. Between the GDTS Too Mail Order fiasco, cancelled pre-sales, overloaded TicketMaster servers and thousands (hundreds of thousands?) 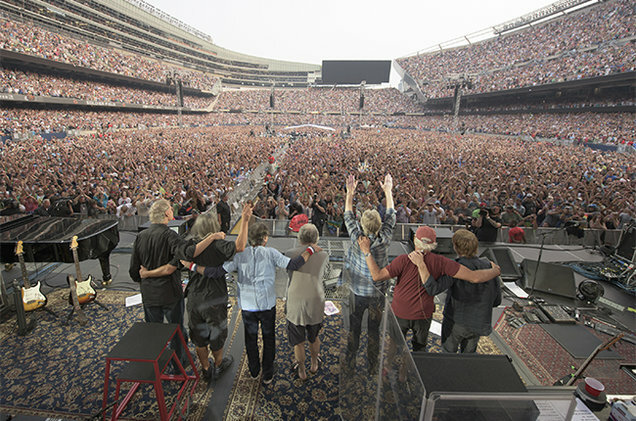 of fans shut out, the sales for the final three Fare Thee Well shows at Chicago's Soldier Field were the source of much angst and wild speculation. 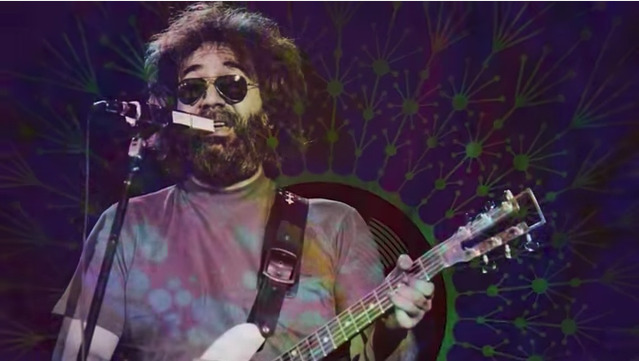 Everybody had their own pet theory -- brokers with insider connections, opportunistic Bears season ticket holders, Peter Shapiro intentionally holding back to enrich the secondary market. 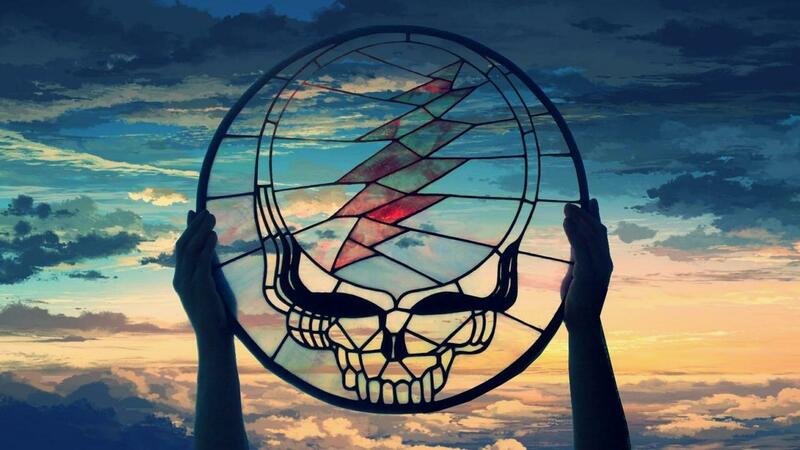 While the simplest explanation -- demand far outpacing supply -- was generally ignored in favor of sexier conspiracies, within a few hours the secondary market began to establish itself and a whole other set of storylines emerged: Brokers were getting $250,000 per ticket! The most expensive event in history! 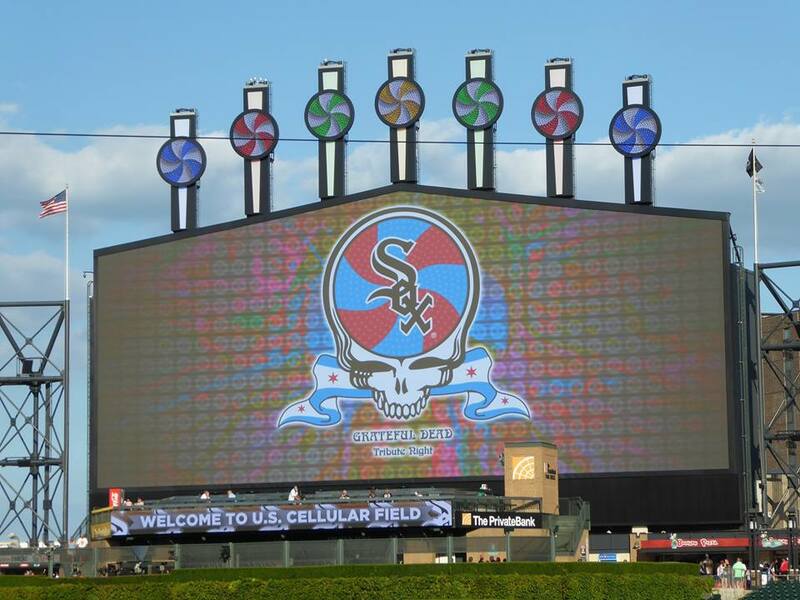 Scammers were taking advantage of desperate Deadheads on craigslist! Now that the dust has settled, I thought it'd be interesting to see what actually happened, and maybe even make some predictions for the future. StubHub, the nation's largest ticket re-sale site is actually pretty transparent -- providing tools to help sellers price their tickets. 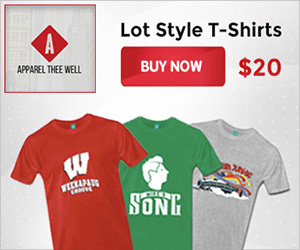 The numbers provided to sellers are actual sale prices, not the listing prices which sent so many fans and members of the media into a tailspin. With a little effort, I took the data available and performed some simple analysis to test my theories. 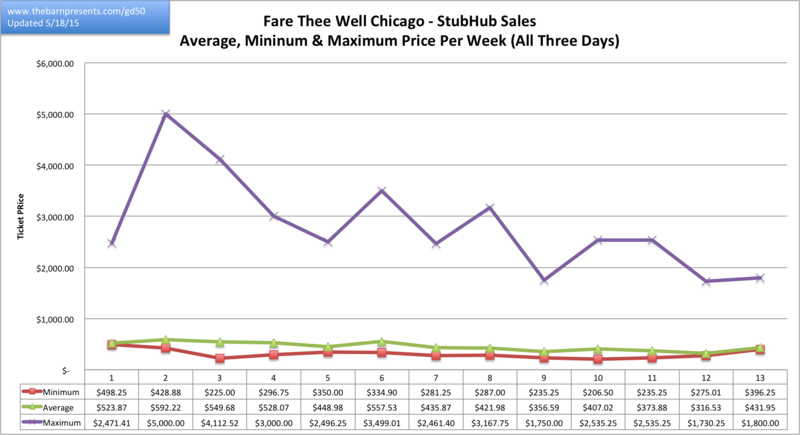 It's not dramatic, but there is a real trend showing that the longer purchasers can hold out for tickets, the more affordable they become. 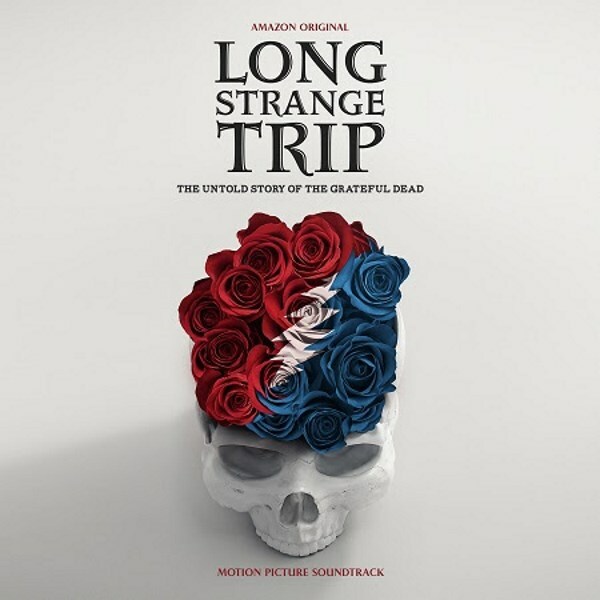 In the time since the on-sale, two additional shows have been added in California as well as webcasts / theater casts / Pay-Per-View for all five of the final Grateful Dead shows. Even now, over a month out from the Santa Clara run, one can get in the door at Levi's Stadium for $74, into a seat with a view for $100. 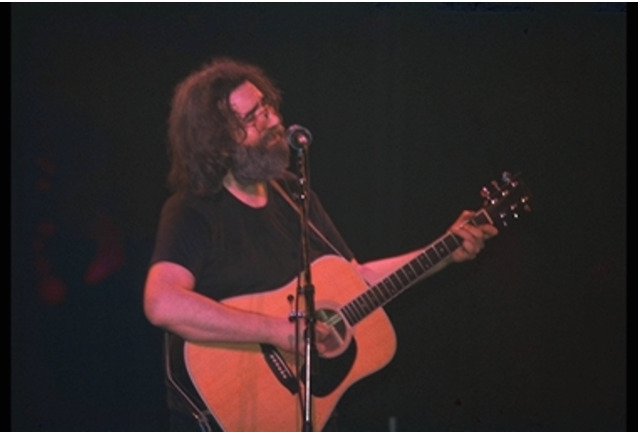 We witnessed dramatic reductions in the final week -- including a slew of tickets being offered for face value at cashortrade.org -- for the Dear Jerry tribute last week, a show which sold out in less than 10 minutes. The reality, too, is that if potential resellers ordered tickets via GDTS Too or hard tickets via Ticketmaster, they have nothing to sell yet, as they still won't be mailed out for another couple of weeks. Once those tickets hit the market, there may be more interesting things developing. So where do we stand? As of this publication, there are 1939 tickets available for Friday July 3rd, 1914 for Saturday the 4th, and 1967 Sunday, the final show. 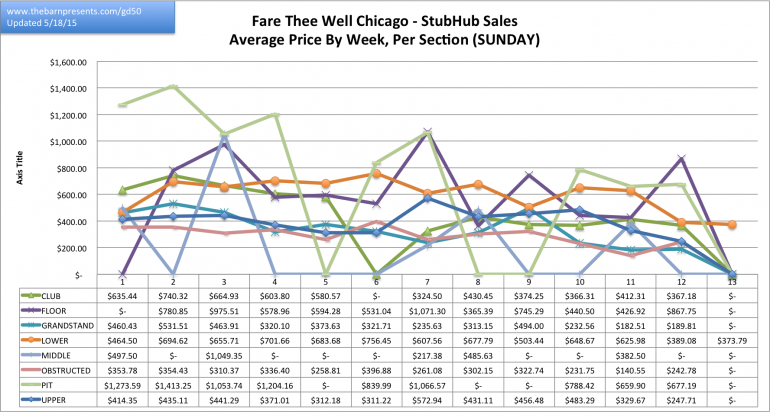 Sure, StubHub isn't the only source for resale on the Internet, but provides a big enough sample size to get a general feel for the market and it's overall volume. How does that compare to what has been sold so far? A total of 2772 tickets have been sold for all three days on the service -- less than half of what is currently available. 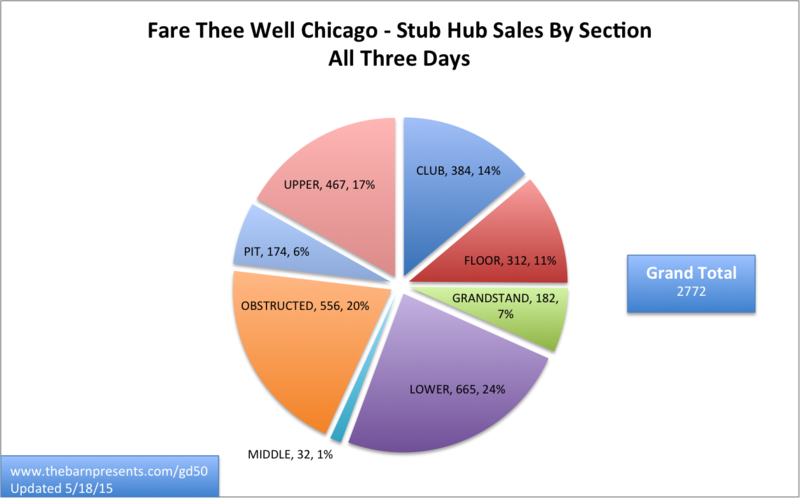 37% of those sold are obstructed view or upper deck tickets, while holder of PIT and FLOOR seats seem to be holding on to theirs (only 17% combined). 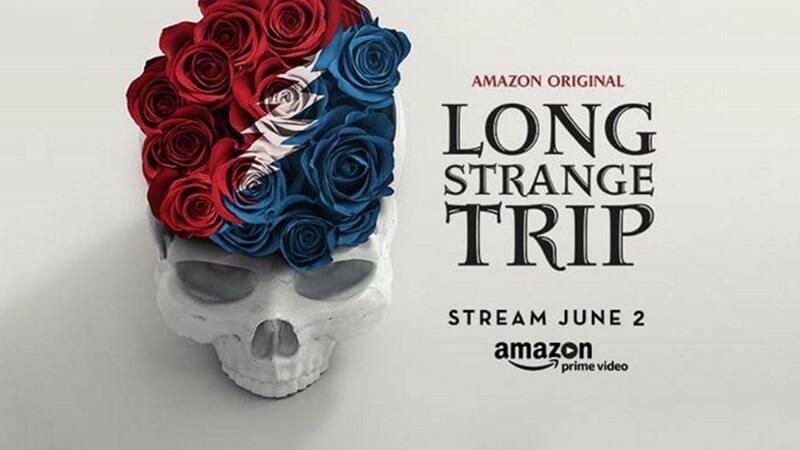 Remember, available tickets for all three shows are 210,000. It certainly seems like tales of the bulk of tickets being snatched up for resale seem to have been at least a bit exaggerated, as only a little over 1% of the house has been sold on StubHub so far. So what are people paying? 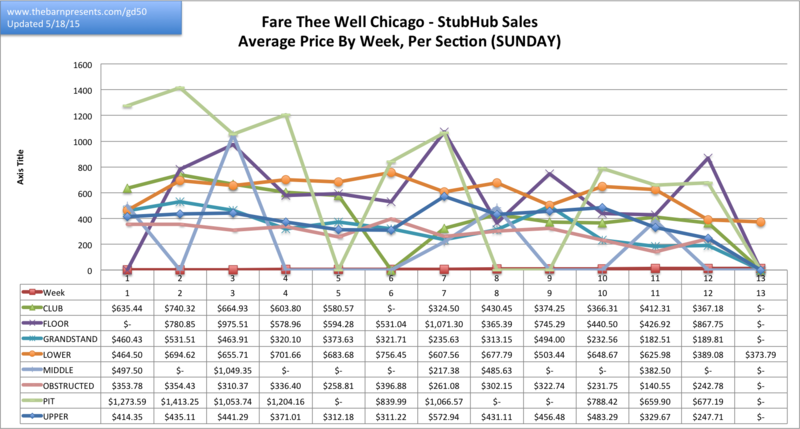 Some people are paying an awful lot, but it looks like the majority are paying somewhere between 1.5 - 3 times face value. 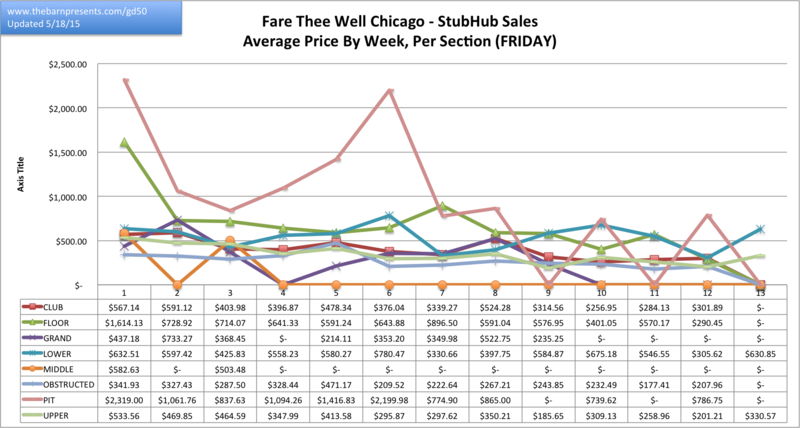 Check out this chart which shows average ticket price by week, with the maximum purchase price and minimum ticket price. The average is certainly trending downward (with a couple of bumps along the way), while hugging pretty tight to the minimum line. Meaning: if sellers want to sell their ticket, they need to be priced low relative to other listings. There are few big fish in this market, so even as the top price runs over $2000 (and up to $5000), there is still a huge gap between those prices and the average. Many more tickets are being sold closer to the minimum. Interestingly, the volume of tickets spiked in the second week they were available and has maintained relatively steady week by week since then, showing a slight increase in recent weeks. I guess some people had to be sure they were "in" right away. It will be very interesting to see where this number goes through June. The data allows for all kinds of cool breakdowns. 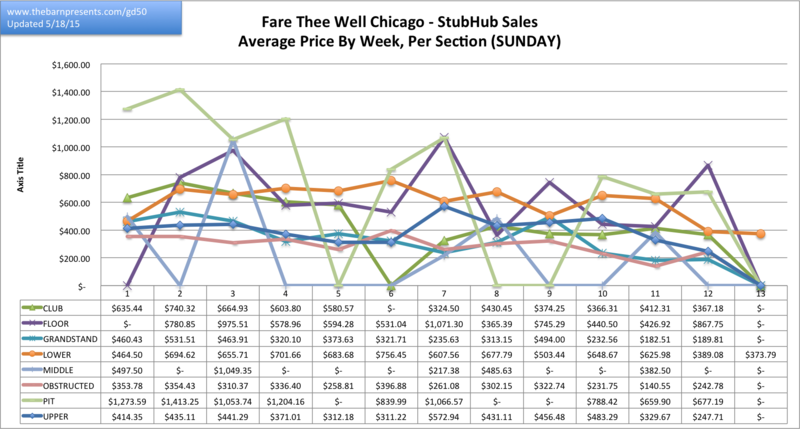 In these three charts I broke down by day of show and by section to see if there are notable trends. 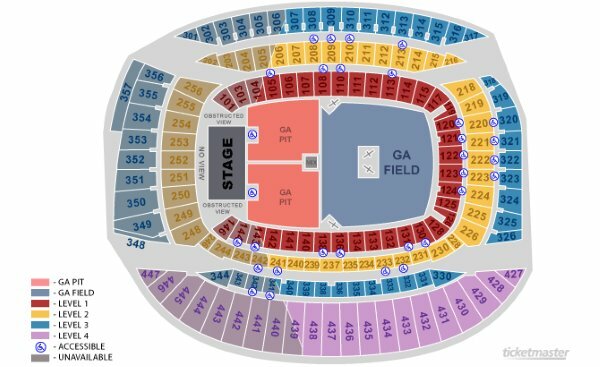 Looks like those PIT tickets are getting the big money, but other sections are fairly interchangeable depending on where people can get the best deal. 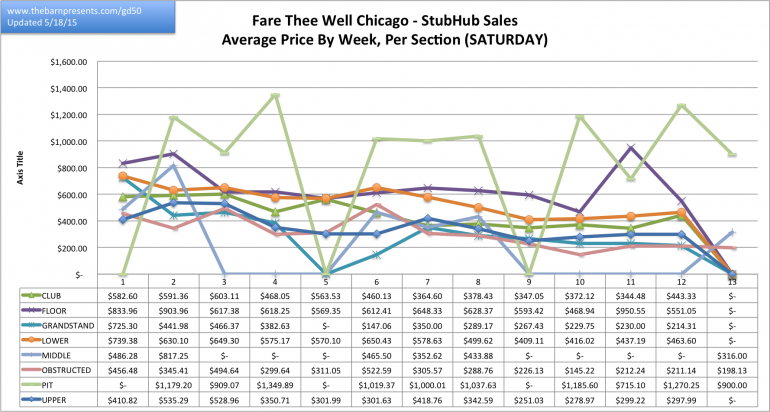 Finally, to put a point on the economics of this, I totaled up the amount of money spent on StubHub tickets so far, and broke it down by section. It amounts to just over $1.3M -- not insignificant, but certainly not the GDP of a mid-sized nation as some were predicting. Relatively speaking, probably in line with a lot of re-sale for events of this magnitude and demand. We'll continue to update this data as it evolves up until the show. But we'd love to hear from you. What do you expect to happen? What would you like to see in our next round of analysis? Anything surprise you? I can certainly see how some may rush to secure tickets to these shows through for-profit resellers. But, I do want to remind readers -- there's plenty to do in Chicago over the July 4th weekend, including plenty of live music and even FTW streaming events. You can still be a part of it all. And if you can wait... or find yourself with an extra -- check out the community at cashortrade.org, a fan-to-fan ticket exchange where participants strive to provide face value ticket opportunities. You never know what can pop up.